'Bundle Of Love' (Paul Black, R. 2007). Seedling #L185B. BB, height 26" (66 cm), Eearly to midseason bloom. Standards warm buff pink blending to pale cream-buff band; style arms pale peach; falls white around beard blending to ivory, darkening slightly toward margin, pale gold texture veins and narrow band; beards tangerine; ruffled; slight spicy fragrance. Seedling #I147A: ( 'Procession' x seedling #B149C: ( 'Abridged Version' x seedling #91135D)) X 'Dolce'. Mid-America 2007. Honorable Mention 2009; Walther Cup 2009. Award of Merit 2011; Knowlton Medal 2013. From Mid-America Garden catalog, 2007: BUNDLE OF LOVE - BB, 26" (66 cm), Early-Midseason. If I could choose only one iris to buy this year, it would be BUNDLE OF LOVE. It comes very close to my idea of a perfect garden iris and judging by its offspring, it is going to be a very important and productive parent. The name was inspired by my little long-haired dachshund, Cher - definitely a BUNDLE OF LOVE. Peach-pink standards are narrowly banded in gold. Styles are rich peach. Falls are white around tangerine beards blending to ivory and a bit darker toward margins. Hafts are blushed peach and narrow gold rims circle the very wide and round falls. Falls are also overlaid with fine, pale green-gold texture veins. Everything is perfectly proportioned for a border bearded. One of the most important traits is the smaller, refined foliage that is well beneath all the flowers. As a parent it has given seedlings that range from very short BBs and IBs to taller ones and even some TBs. BUNDLE OF LOVE allows the expression of other colors and patterns over its more pastel palette. Vigorous growth creates clumps full of show stalks carrying 10-14 buds. 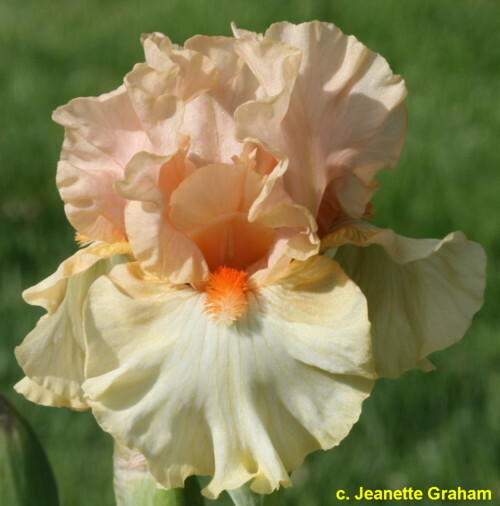 A pot of BUNDLE OF LOVE auctioned by the Median Iris Society at the 2006 AIS convention brought an amazing $150.00. Thank you Jean Morris for your support of MIS. Hopefully having this genetic material to work with a year in advance will be worth the price. Sdlg. L185B: (Procession x (Abridged Version x ((Centerfold x Wings Of Dreams) x Birthday Gift))) X Dolce. Photo inner back cover. $35.00. jpg IMG_3157-X2_bundle_of_love.jpg manage 143 K 21 Feb 2016 - 08:31 BrockHeilman Please contact Brock Heilman for image use.